The irony of Edna & Harvey: Harvey’s New Eyes is that I’d recently written a piece about how adventure games had gotten a new lease on life by abandoning the trappings of convention that defined them in the 90s. Then along comes this game that unpleasantly proves my point. Don’t get me wrong, Harvey’s New Eyes isn’t a terrible adventure. But it does highlight many things about the genre that eventually pushed it to the fringe and left many players wanting. Harvey’s New Eyes is a sequel to Edna & Harvey: The Breakout, which itself was originally just a German university project. The original, in the tradition of LucasArts point n’ click adventures, didn’t do so hot upon its English debut, but that was largely blamed on a shoddy translation. This time around, Daedelic doesn’t have that excuse. In many ways, Harvey’s New Eyes is a modern example of a bygone era. The game hews closely to the conventions of 90s graphical adventures, right down to the more annoying aspects of games from that period. It starts out very slow, with the first two to three hours threatening to make players quit due an initially unappealing story. Harvey’s New Eyes focuses on Lilli, an orphan girl at a convent who is treated cruelly by head nun. 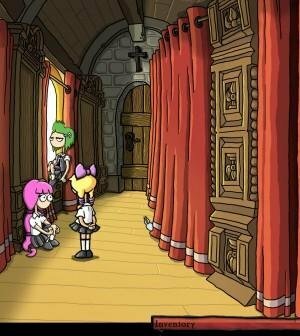 An obnoxiously snarky narrator and a lot of pointless tasks initially burden the introduction, and it’s only after a few hours that the game begins to reveal its darkly comic/clever side and bizarre sensibilities. In other words, it starts out like an obnoxious used car salesman whose idea of a joke is tangential insult, but then that gradually cedes to an appealing sort of comedic weirdness reminiscent at times of Twin Peaks. That originality in dark comic moments is just about the only thing the game has going for it as the story advances. The mechanics are positively ancient by modern adventure standards, still relying on a LucasArts SCUMM style interface to play, and falling into the trap of obscure, nonsensical solutions to puzzles that often ignore logic, something even the game acknowledges in one voiceover moment. 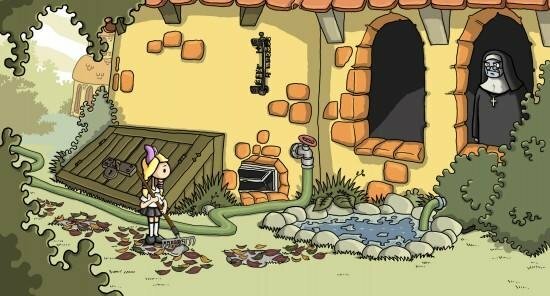 There are other adventure games that have ignored logic for comedic effect in the past, such as Telltale’s own wildly successful series of Sam & Max games, but even then, a consistent lunacy was established so that even if the game world defied the logic of reality, it had its own internal system that it obeyed. Another issue is the rather cheap tactic of having conditions for certain puzzles change by simply leaving the area and returning to it. Again this is a rather arbitrary and unfair way to prevent the quick solving of puzzles, and is usually implemented for the sake of padding out gameplay duration. 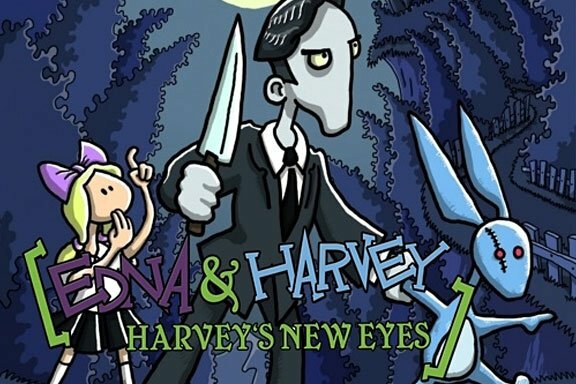 What this all boils down to is that despite the fact that Harvey’s New Eyes has some genuinely funny and entertaining moments, it’s bogged down by its archaic mechanics and design sensibilities. When you have a player wandering through every area, methodically using every inventory item on every environmental object in the hopes that sheer process of elimination will solve a puzzle, there is a problem at hand. And it’s a problem that’s been dealt with by newer adventure games so as to avoid this kind of tedium and frustration for the audience. If you’re a fan of adventure games that is starved for any new kind of content and don’t mind a title that will set the wayback machine to 1994 in terms of game mechanics, then the charm of Harvey’s New Eyes will probably win you over. If you’re looking for a $20 Steam game that doesn’t ask for such a specific level of tolerance, you’re probably better off sticking with The Walking Dead. If you’re a fan of adventure games that is starved for any new kind of content and don’t mind a title that will set the wayback machine to 1994 in terms of game mechanics, then the charm of Harvey’s New Eyes will probably win you over.